"Eliminate Age Spots With A Simple Longevity Diet And Effective Antiaging Skincare!" What are age spots? What are liver spots? Age spots (also called liver spots, brown spots, or solar lentigines) usually appear on the face and hands of people who are over age 50 but it can certainly happen to people who are younger. With the standard American diet prevalent these days, more people under the age of 40 are seeing a spike in liver spots. They're usually flat and brown in color (sometimes dark brown, sometimes light brown) and they appear on areas of the body that are exposed heavily to the Sun. Liver spots often times appear on the face, neck, hands, arms, and the upper back and shoulders because those areas are most often exposed to the Sun. As our bodies age, solar lentigines start to appear on our skin as a result of years of overexposure to the Sun. Age spots are caused by the body's inability to protect itself from the Sun's harmful UV rays. 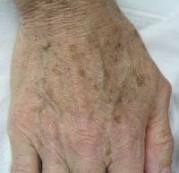 The skin's amount of melanin pigment has deteriorated at this point if liver spots are showing. The melanin is what protects our skin from the harmful rays of the Sun. Liver spots are also a result of free radical damage within the body. 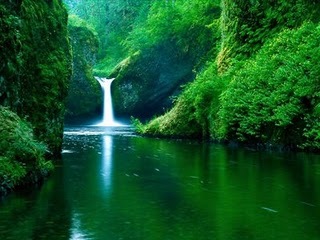 Specifically, this build up of free radical waste in the body is medically referred to as lipofuscin accumulation. Therefore, age spots are a result of human aging in many cases. Are Liver Spots And Age Spots Related To Skin Cancer? The answer to that is usually "No." If you notice spots of any kind on your skin, it's a good idea to have it looked at by a licensed medical professional. If the medical professional is not sure whether or not the spot or spots are brown spots or skin cancer, they may remove the spot and send it in for a biopsy. skin cancer usually looks like a skin sore or a mole and can sometimes be a skin growth Melanoma, the most common form of skin cancer, is very similar to solar lentigines in that the causes and symptoms are very similar. The main difference between solar lentigines and skin cancer is that a person can die from skin cancer but will not die from liver spots. Age spots are not fatal; skin cancer CAN BE be fatal. Can Antiaging Skincare Eliminate Liver spots? Antiaging skincare can get rid of age spots TEMPORARILY. Liver spots can sometimes be light enough for antiaging skincare products to conceal or cover them up. Unfortunately, since brown spots are sometimes more than just a skin problem, anti aging creams can't remove the liver spots permanently. If the brown spots are an indication of nutritional deficiencies in the body, it won't matter how much antiaging skincare you use. The liver spots will not go away if the nutritional deficiencies of the body are not addressed. When considering an antiaging skincare product to use to get rid of wrinkles and age spots, please be aware of the fact that the antiaging skincare products(s) must be of a high quality. In other words, a great antiaging lotion that claims to eliminate liver spots should contain high quality ingredients. A very important ingredient that should be in an antiaging skincare product to eliminate liver spots should be Retin A or Retinol. Liver spots are a good indicator of poor health. The cells that are being ravaged by free radicals can be directly impacted in the brain and liver and accelerate a person's aging. 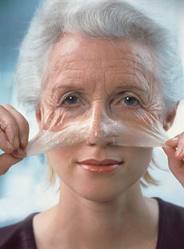 Anti aging creams only mask the problem by sometimes covering up the brown spots and "hiding" them from sight. That will only mask the problem. Anti aging lotions might make your skin more youthful (temporarily), but they won't get rid of liver spots. The best way to prevent the solar lentigines is to use sun block protection when in the Sun or to simply limit your exposure to sunlight to just 15 minutes a day. An SPF rating of 50 or more is recommended for best results when trying to prevent age spots and skin cancer. My wife and I try to use SPF 75 or more when we're out in the Sun; especially when we're on vacation. Anti aging treatments such as a longevity diet can get rid of liver spots permanently. Since the brown spots are often times a strong indication of the body's deficiency of nutrients and minerals, a longevity diet gets rid of liver spots by replenishing the body with essential vitamins, minerals, and nutrients that the body needs. A great longevity diet should replenish the body with essential nutrients and also reverse the damage of oxidation caused by free radicals in the body. Vitamin E, vitamin C, selenium, DMAE (dimethyl-aminoethanol), chromium, zinc, gluthathione, calcium, vitamin D, and Retin-A are a few examples of the vitamins, nutrients, and minerals that a solid anti aging diet should provide to the body in order to permanently eliminate age spots (also referred to as senile lentigines or solar lentigines). You can also eliminate liver spots through the use of laser treatments or a single laser treatment. However, they are not a recommended way to get rid of senile lentigines (in our opinion) because they can leave damage on the skin that can often times be irreversible! Liver spots can be frozen with the use of liquid nitrogen by a licensed practitioner. There is usually no scarring left on the skin. Another alternative is burning off the lentigines with the use of acids but such a procedure can be abrasive to your skin. A longevity diet of anti aging foods is the best way to get rid of age spots (and prevent skin cancer) and stimulate the renewal of youthful skin cells naturally! !